﻿National Lasagna Day: Calendar, History, Tweets, Facts, Quotes & Activities. National Lasagna Day is dedicated to appreciating lasagna. The true origins of when and how National Lasagna Day came to be are unclear. However, Google reports of National Lasagna Day began to appear in the 21st century. Lasagna is a flat-shaped pasta that is layered with sauce and various ingredients, the most popular including beef, spinach, cheese or seafood. Lasagna is believed to have originated in Naples, Italy. The first lasagna recipe appears in The Liber de Coquina (The book of cooking/cookery), which is one of the oldest medieval cookbooks. Some have suggested that lasagna comes from the Greek word laganon, which stands for a flat sheet of pasta dough. Others however suggest that lasagna comes from a 14th-century British recipe called Loseyn, which included layering ingredients between pasta sheets. National Lasagna Day is observed on July 29th of every year. According to Guinness World Records, the world's largest lasagna was created by Magillo Restaurant and Macro Supermarket in Wieliczka, Poland. On June 20, 2012, more than 5,000 people contributed to making the enormous lasagna that measured 25m by 2.5m and contained 800kg of meat, 500 liters of tomato sauce, 2,500kg of lasagna pasta sheets and 400kg of mozzarella cheese. As per the USDA, 100g of lasagna contains 135 calories, 4.9g of fat and 15g of carbohydrate. AllRecipes.com has reported that John Chandler has created the world's best lasagna. Chandler shared his recipe on the site in 2002. By 2013, the recipe had been pinned on Pinterest more than 25,000 times and has 10,423 ratings on AllRecipes.com. Every month, the recipe is viewed by 20 million visitors. Lasagna is the favorite food of Garfield, a comic strip cat. Enjoy lasagna specials on National Lasagna Day at your favorite eatery. 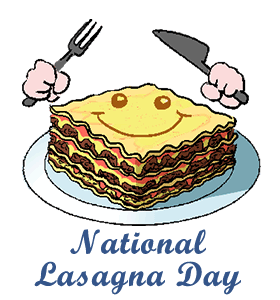 Many restaurants offer free lasagna, discounts and Lasagna special to celebrate the day. Cook a lasagna in the slow cooker, rather than a conventional oven. As with a baked lasagna, layer noodles, cheese and toppings in the slow cooker and let it cook slowly. Slow cooker meals are great for a busy family that still likes to eat a nutritious meal at the end of a long day. Cook your lasagna in a dishwasher. According to MythBusters, the popular television show on the Discovery network, this is definitely feasible. Attend a cooking vacation in Italy where you week-long cooking class at Taste of Italy cooking school in Tuscany, Italy where they teach students how to make lasagna the traditional, Italian way.